I last time I made this-–according to scribbled notes in Marcella Hazan’s Second Classic Italian Cookbook*–was on September 18, 1997! What took me so long to do it again? It is delicious! 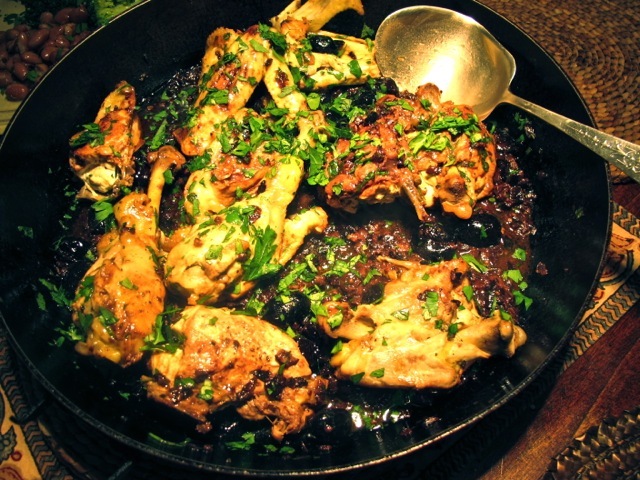 It needs good black olives–I use Greek, preserved in oil, from the stall in Castres market–they are juicy. So, as they say here–doucement [gently does it]. Heat the oil in a large sauté pan and fry the garlic until it starts to color. Brown the seasoned chicken pieces over a medium heat–turning them every couple of minutes. 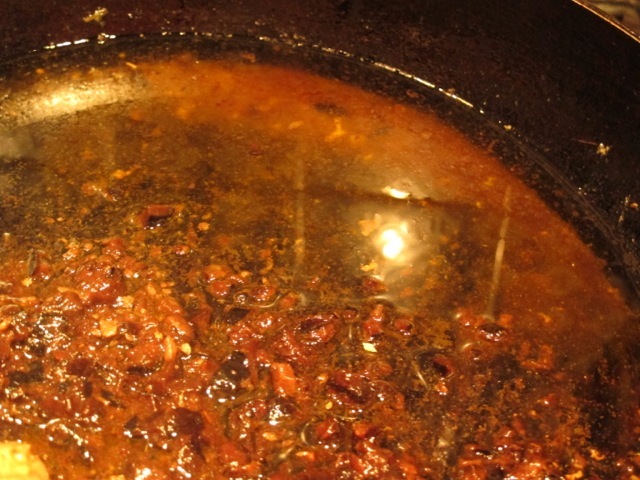 Cook on until only half the liquid remains–about 20 minutes. Add the chopped olives and anchovies and turn the chicken pieces over in the mixture. 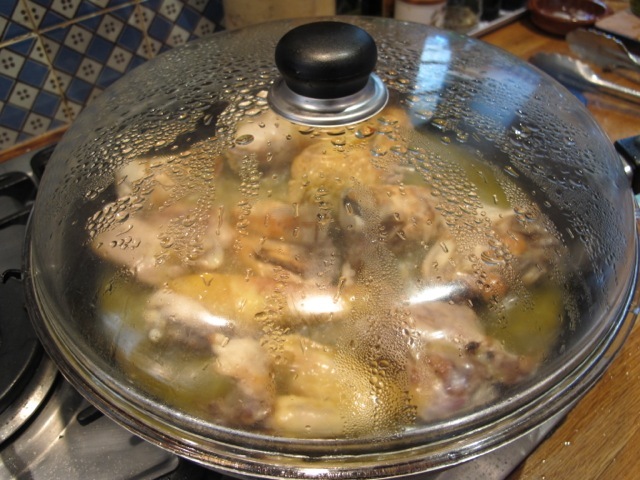 Remove the lid and tilting the pan carefully spoon off most of the fat/oil. Add the remaining olives and parsley and turn everything over and heat through. Add the lemon juice and turn everything again. * Marcella Hazen is one of the guiding lights of my cooking. Her first and second cook books were combined into Essentials of Classic Italian Cooking. Made this Saturday night, even though I could not find black olives in oil locally. But black olives à la grècque worked fine. Served with our first new potatoes for 2014. And we dined on Whisky! Goes very well with this strong-tasting dish. Robin, there is an article in the online Daily Mail today on the new Poldark including stills from the current production. Sorry, I am not sure how to send it to you but maybe you can look it up online if you are interested. Thanks Susan–I’ll look out for it. Nice to see all the blotches on the recipe page. Makes me feel better about the turmeric stains in your book that I handed to you for autographing. I was cringing! 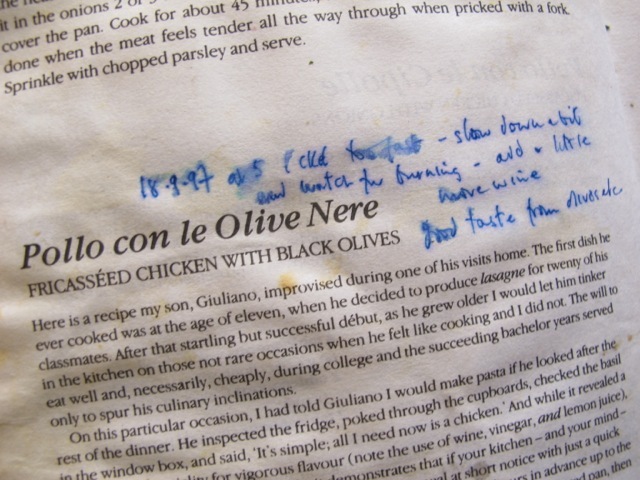 Cookbooks by definition get used when cooking and to my mind look better when they have a few thumb prints on them! In any case turmeric is a healing spice.